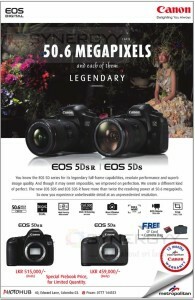 You know the EOS 5D series for its legendary full-frame capabilities, resolute performance and superb image quality. And though it may seem impossible, we improved on perfection. We create a different kind of perfect. The new EOS 5DS and EOS 5DS R have more than twice the resolving power at 50.6 megapixels. So now you experience unbelievable detail at an unprecedented resolution. Special Pre-book Price, for Limited Quantity.